One gallon Hoosier style jar with metal screw on lid. I said "style" because, I don't know if this in one of the original Hoosier jars. I have no idea of the age, because it was bought at a church rummage sale around 10 years ago. 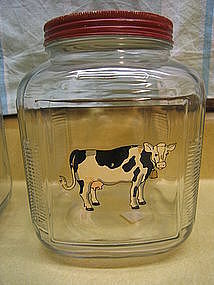 The cow is just a decal and was on the jar when purchased. I have no idea if it came from the manufacturer this way, or the previous owner added it to match their kitchen motif. There are no chips, cracks or breaks to the glass and the lid has no dents and removes easily, however, there is wear to the red finish. I have 2 of these jars available and priced individually. I need your zip code to calculate the postage.